Improved support for reading broken 3ds files - invalid positions that are not used in TriangleIndices are fixed. This prevents creating too big bounds value that is usually used to position the camera after the model is loaded. Added Materials3ds dictionary that contains all the raw material data and maps (textures) that are defined in 3ds file - event properties and textures (for example bump map) that are not used in WPF. Added GetKeyFramesData method that returns raw key frames data that are read from 3ds file. Added GetOptimizedMeshGeometry3D that returns the OptimizedMeshGeometry3D struct for the specified model name. OptimizedMeshGeometry3D contains Normals, Positions, TextureCoordinates and TriangleIndices lists that can be used to get quick access to mesh data (access to data is much faster than when using MeshGeometry3D). Prevented "cross thread access" exception when the Reader3ds instance is created on another thread the Read method is called. Improved animating objects in some cased when the animation does not start at first frame. Fixed exporting XAML when object name contains unsupported characters. Improved reading broken 3ds files. Added TryReadBrokenFiles and IsBroken properties to Reader3ds. If TryReadBrokenFiles is set to true (by default it is false) reading broken 3ds file does not throw exception but read as many 3D objects are possible. Show evaluation info dialog only once per day (evaluation version only). Viewer3ds v3.2: added export of all cameras defined in 3ds file as comments. Also added selected camera description in exported xaml. Added possibility to read tga into BitmapImage with static Read method in a new Ab3d.Common.TgaReader class. Note: The previous versions of Reader3ds already supported reading tga files. But it was not possible to read tga files in your applications. This is now possible and enabled you to convert tga images to common files (for example png) that can be used with xaml created from 3ds file). This feature is available onyl in pro version. Fixed security exception in partially trusted WPF Browser applications - before the multi treading code was not able to get the number of processors on the system. Fixed reading some tga files. Also does not stop loading 3ds file when an exception is thrown while a texture image is creating. Fixed licensing code for WPF Browser applications (partially trusted) - before licensing did not work when both Ab3d.Reader3ds and Ab3d.PowerToys were used (defined in license.licx file). Improved reading performance by up to 80% by optimizing the code and adding multi-threaded 3D objects processing. Added ProgressChanged event to get progress reports when reading 3ds file. Added GetXaml method to Reader3ds class. Added Lights collection to Reader3ds to easily access all the read lights. Improved reading FieldOfView from 3ds file and added support for animating FieldOfView. Improved reading specular materials - now the SpecularMaterial's Color is adjusted to get better results based on SpecularLevel read from 3ds file. Improved support for running in partially trusted environment - for example in WPF Browser Application. Added support for reading tga image files (with internal tga file reader). The ReadFile method now throws FileFormatException if file format is not supported or file is broken (instead of some BinaryReader or OutOfMemory exception). Added IsCameraAnimated property on Reader3ds - specifies if the 3ds file defined camera animation. Fixed setting camera's UpDirection - before it was always (0,1,0) - now it is correctly calculated from the LookDirection. Fixed calling AfterReading3dsFile event in Viewport3ds control. Separate commercial and evaluation version. Added ResolveTextureFileCallback and ResolveAllTextureFiles properties to Ab3d.Reader3ds. 1) texture file is supported image and exist on disk - use the file. Call ResolveTextureFileCallback if the texture file is not found or if ResolveAllTextureFiles property is true. Added support for Basic / Pro versions. Fixed licensing problems on 64-bit OS. Integrated licensing system - first commercial version. Fixed bug where camera name or light name is longer than 8 characters (ArgumentOutOfRangeException: Length cannot be less than zero.). Added public static get ExpirationDate - so it is possible to get expiration date without actually creating an instance of Reader3ds (this can already throw expired exception). Fixed exception when reading 3ds file without any animation keyframe. 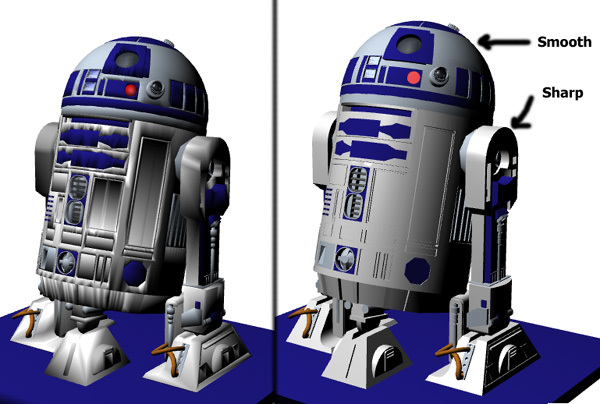 Support for smoothing groups - also automatically support flat and shaded models. This greatly improves rendering quality (see the image below). Added Shading property to define None, Flat, Smooth or SmoothingGroups shading. Default value is SmoothingGroups that uses the Smoothing Groups values stored in 3ds file to define which edges are smooth and which are flat. This option produces the results as in the 3d model designer. However if you wish to force the flat or smooth looking objects choose either Flat or Smooth (before reading the 3ds file). Also if performance is much more important than rendering quality choose None. Fixed bug when reading from reasource and 3ds file contains texture files (exception was thrown). The previous version has wrongly convert position from 3ds coordinate system to wpf coordinate system. The difference is that the x axis now points to the right instead of the left and the z axis points to the viewer and not away from it. This version by default uses new coordinate system, but if your application depends on the old one, you can simple set this property to true. But note that this can only be a temporary solution. Set UseOldCoordinateAxis property to true to use old coordinate axis. Added Materials property - Dictionary that can be used to access all the materials defined in 3ds by their name. Added methods without object name - to translate, rotate and scale all the objects and lights (as using constant Ab3d.Reader3ds.RootModelGroupName for objectName). Reader3ds can now properly import the objects hierarchy. For example if we have a robot arm (see image below) and we rotate the base than all the child joints and arms are rotated accordingly. There is a new method DumpNamedObjects that can be called in immediate window (after the debugger is stopped and the 3ds file is already read with Reader3ds) to get all the available named objects and a hierarchy of the objects. Transformer3ds is a new class in Ab3d namespace that can greatly simplify transforming and animating objects read with Reader3ds. The class contains many methods - for more info see RobotArm sample and help.